Apple on Monday began rolling out its TV app in Australia and Canada ahead of tomorrow's scheduled iOS 11 and tvOS 11 release, which will deliver the one-stop streaming hub to seven additional countries later this fall. As promised during last week's iPhone event, Apple is expanding availability of the TV app to seven countries — Australia, Canada, France, Germany, Sweden, Norway and the UK — by the end of 2017. Apple TV owners running the latest tvOS software in Australia and Canada discovered the TV app, or at least its icon, on their home screen earlier today and took to Twitter to note the the change. On fourth-generation Apple TV units, the TV app seems to be a placeholder instead of a functional app, but its presence hints at an imminent release likely timed to coincide with tomorrow's iOS 11 and tvOS 11 launch. In addition, a few iOS 11 beta testers with access to Apple's GM seed saw TV go live on iPhone, but not yet iPad, reports iPhone in Canada. Currently, the TV app only installs and appears on iOS when a device is connected to a cellular network. The app reverts back to the legacy Videos title when on Wi-Fi. Initial support appears limited to CraveTV, Treehouse, CBC TV, City TV, ICI Tou.tv, FXNOW, MUBI, Hopster and CuriosityStream, though more channels are expected for inclusion when the service sees public release. Last Tuesday, SVP of Internet Software and Services Eddy Cue said Australia and Canada would get access in September, but failed to specify a detailed timeline for launch. With the app now showing up on Apple TV units in those countries, it appears the company is gearing up for a rollout alongside iOS 11 and tvOS 11, or shortly thereafter. 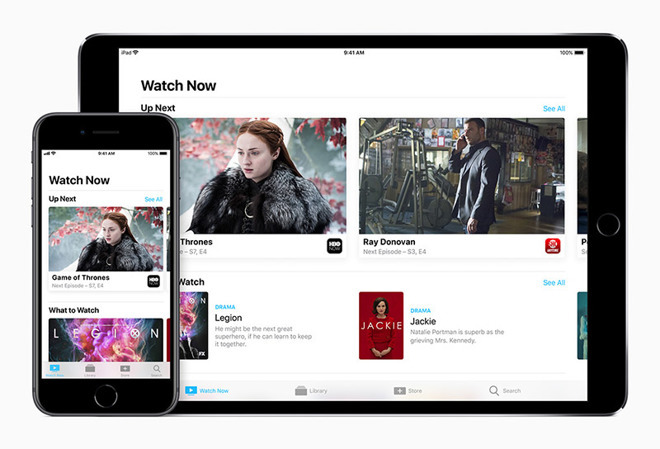 Unveiled last year, and released to U.S. customers in December, the TV app acts as a central hub for browsing, discovering and managing streaming content across a variety of providers and owned media. Apple currently offers support for more than 60 third-party services with support for cross-platform syncing and deep Siri integration. Later this year, Apple will add a new Sports tab to the TV app, which offers access to live sports.